On Saturday, March 31, the Oregon state finals for this year's Poetry Out Loud competition were held in Salem on the campus of Willamette University, which was for the most part enjoying Spring Break at the time and so heard little about it; coverage in the local press was pretty slim, too, even though the winner of Saturday's contest goes on to represent Oregon at the National finals scheduled for May 13-15 in Washington, D.C. Go Oregon! 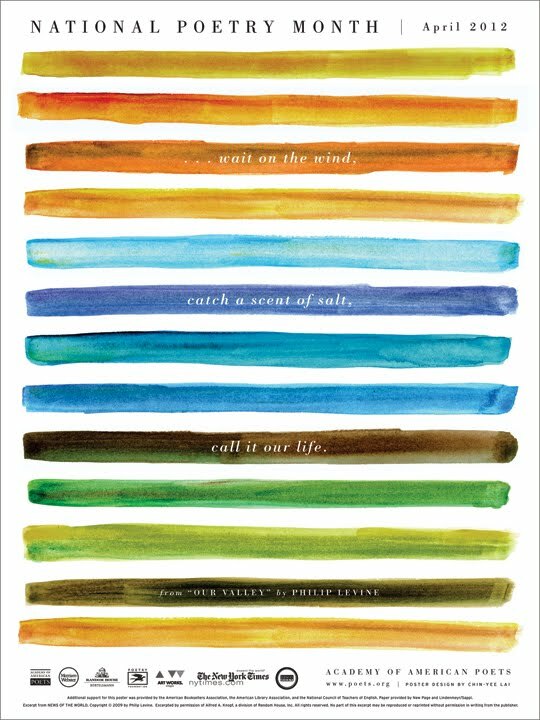 Saturday may have marked a milestone in some high school student's life—P&PC reporters can, as of yet, find no mention of who prevailed— but it might also be said to have marked the beginning of National Poetry Month 2012 in Salem as well. If you're in and around the state capital this month, you'll find plenty of poetry and poetry-related events to keep you busy. From open mics to visiting authors, poetry contests, and even a lecture on the poetry of fishing, you could say that this year's events are pretty, uh, diverse, and so we've done our best to gather as many as possible here for your convenience and easy reference. N.B. P&PC's fact checkers have been out of the office and on Spring Break for the past week, so we can't vouch for the absolute accuracy of the following times, dates, and places. We therefore recommend that you double check with each sponsoring organization to make sure that information is up to date. The library continues its tradition of exhibiting finely printed poetry broadsides in celebration of National Poetry Month. This year’s show focuses on the works of four Oregonians—Carl Adamshick, twin brothers Matthew and Michael Dickman, and Michael McGriff—all of whom are recent winners of major national poetry prizes. To celebrate National Poetry Month, Salem Public Library invites area poets and poetry aficionados to participate in this special edition of Grown-Up Storytime. Local actors Claire Diehl, Jeff Sanders, Tom Wrosch, Geri Greeno, and Lyndsey Houser read contemporary poems. Also, anyone who has a favorite poem—whether original or by a published poet—may also read. The only requirement is that it takes five minutes or less. For more information or to reserve a place on the program, contact Ann Scheppke at 503-588-6124 or ascheppke@cityofsalem.net. Held in conjunction with (who knew?) 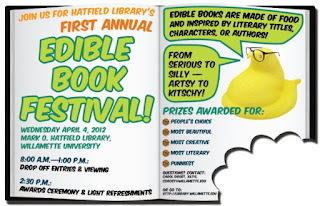 the International Edible Book Festival (Festival international du livre mangeable) this, uh, feast for the eyes offers some, well, food for thought as entries are made of food and inspired by literary titles, characters, or authors. Looking for inspiration? Check out some entries from the Seattle Festival, University of Puget Sound, Duke, and the University of Illinois. Viewing and drop-off of entries from 8:00 am - 1:00 pm; awards ceremony at 2:30 pm. 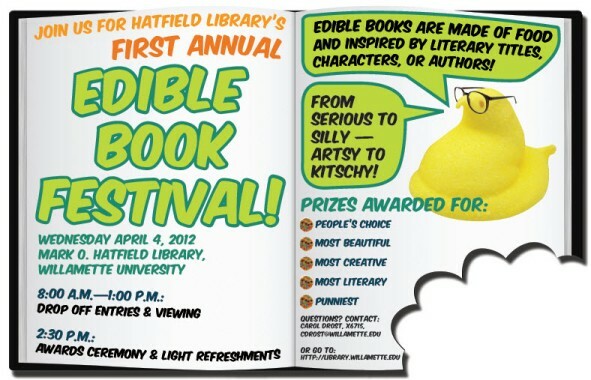 Prizes include People's Choice, Most Beautiful, Most Creative, Most Literary, and Punniest. In partnership with Literary Arts, Inc., of Portland, the Hallie Ford Chair and English Department will host a reading by three finalists—poet Geri Doran, memoirist Jennifer Lauck, and graphic novelist Greg Rucka—for this year's Oregon Book Award. The Oregon Book Awards are presented annually for the finest accomplishments by Oregon writers working in various genres, including fiction, poetry, literary nonfiction, and young adult literature. Meeting on the first Thursday every month, this group shares favorite poems from British and American poetry written before the First World War. Each member brings a handful of poems to read aloud to the group. For more information call Wendell Buck at 503-588-6317. This year's Art & Poetry Exhibition will feature work by students from Hillcrest Oregon Youth Authority Correctional Facility. During this project, poet Dawn Diez Willis and photographer Barry Shapiro spent the semester bringing art and poetry to a group of exceptional young artists who wrote and then illustrated poems. Spend your lunch hour with Western Washington University English professor Henry Hughes as he shares his own poetry and meditates on various "classic and contemporary poems and stories that involve the art of angling." Dan Kaplan is the author of Bill's Formal Complaint (The National Poetry Review Press, 2008) and the bilingual chapbook SKIN (Red Hydra Press, 2005). His work has appeared or is forthcoming in American Letters & Commentary, VOLT, Denver Quarterly, and elsewhere. He teaches at Portland State University and is visiting professor of creative writing at Willamette this semester. Sponsored by the Friends of Salem Public Library, this might be the place to find that used copy of Rod McKuen or Jewell that you need to complete your collection. Technically not in Salem, Silverton's annual festivities—poetry readings, workshops, feasting and hobnobbing—are worth putting on your to-do list since they're only a couple miles down the road. Public events held April 13, 14, 15, 18, and 21. The Willamette Store hosts five Airlie Press poets—Chris Anderson, Donna Henderson, Stephanie Lenox, Annie Lighthart, and Dawn Diez—in a cornucopia of locally-sourced Willamette Valley poetry. Admission is free with a suggested donation of canned and other non-perishable food items for Marion-Polk Food Share. For more information, call 503-370-6772. A cornucopia of awards—for best rhymed poem, best unrhymed poem, and best haiku in each category—are distributed each year by the Willamette Store to poets ranging in age from elementary school to adult. Come out for an evening of spoken word poetry focusing on the intersection of race, gender, sexuality, and other aspects of our identities. Say the organizers of this event, "We are still looking for poets to read a piece or two. This is not at all limited to Willamette students, so please spread the word and get in contact if you or someone you know are interested in speaking!" Click here for the Facebook Event Page. Enjoy a cup o' joe at Willamette University's student-run coffee house as writers from The Chrysalis—Willamette's campus literary magazine—read from their published work. 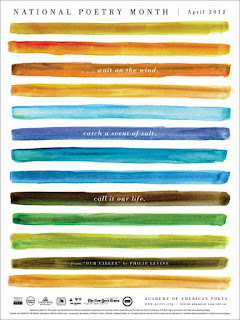 Take a break from the week and come listen to Willamette faculty and staff read their favorite poems. Bold Expressive Arts Theater (B.E.A.T. 2012) will perform live at West Salem High School. Students from the Oregon School for the Deaf will show a variety of talent on the stage. They will perform dance, song and poetry through American Sign Language. For more information on the show, call (503) 378-3840. Come sing along to this fantastic musical! Lyrics are projected on the screen, so don't worry if you don't know all the words. Doors open at 6:30. Cost: $8 adults, $4 youth (16 and under). Winners of the Willamette Store's sixth Annual Poetry Contest start up an open mic by reading from their work. Have a glass or two of wine and order from a menu of appetizers, soups, sandwiches, and chocolates as adult winners of the Willamette Store's annual poetry contest read from their work. For more information call (503) 399-9463. Willamette University's 'zine is accepting poetry submissions for its next issue. Accepted work submitted before April 21 will be read on stage at this year's Wulapalooza. Submissions from students may be sent to mama.aint@gmail.com; submissions from students and community members may also be delivered in person at Mama's festival booth. This two-evening program will celebrate the written word with a combination of dramatic readings of plays, poetry, and prose by students in the Theater Department's Atypical Performance class and the English Department's Senior Seminar in Creative Writing.